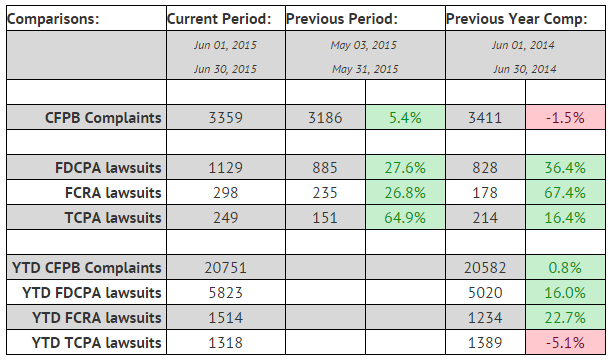 Quick analysis: The summer heat must be rekindling those warm old memories of litigiousness, because June saw uncharacteristically strong consumer litigation activity across all three primary statutes: FDCPA, FCRA and TCPA. All three had a big month, with double-digit increases over their performance in May. Year to date FDCPA suits are roaring back from a four-year lull, with growth not seen since 2011. It is up 16% over this time last year, and shows no imminent signs of slowing down. FCRA is up 22.7% over this time last year, which itself was a record year. TCPA is still down over last year (continuing a trend for TCPA in 2015), but by a much smaller margin than last month. It cut the YTD decline almost in half from 9.2% to 5.1% due to a very strong June (up 64.9% over May). If it keeps this momentum, it will surely come out ahead for the year again in July or August. CFPB complaints against debt collectors are also up YTD over 2014, but by the slimmest of margins – .5%. Interestingly, CFPB complaints are up significantly over last month, which is not inherently unusual, but it is unusual to see it this early. It often takes CFPB complaints another few weeks of trickling out before they overtake the previous month. ∙ For June 2015, about 36% of all consumer litigation plaintiffs had sued at least once before under consumer litigation statutes. ∙ About 817 different companies were sued. ∙ Class actions were relatively high, with 12.9% for FDCPA, 14.1% for TCPA and 11.1% for FCRA. ∙ The Illinois Northern District Court of Chicago had the most litigation filed in it, with 91 lawsuits invoking consumer statutes. ∙ Attorney Craig B. Sanders represented the most consumers for the month – 59. Of those cases, there were about 1326 unique plaintiffs (including multiple plaintiffs in one suit). Of those plaintiffs, about 471, or (36%), had sued under consumer statutes before. About 817 different collection firms and creditors were sued. There were 3359 complaints filed against debt collectors from Jun 01, 2015 to Jun 30, 2015. This includes 3103 (92%) timely responses to complaints, and 256 (8%) untimely responses. Of the company responses, consumers accepted 0 (%) of them, disputed 522 (16%) of them, and 2837 (84%) were N\A.